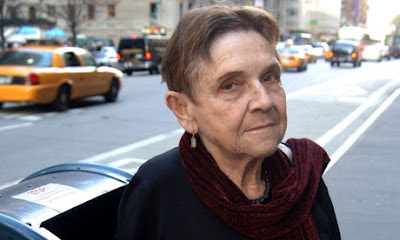 The American poet, Adrienne Rich, died last Tuesday at the age of 82. Obituaries - Irish Times; New York Times; Guardian; BBC. Her poems at the Poetry Archive; at PennSound. As a tribute to her and to the gathering of writers and friends that was the Boyne Berries launch on Thursday evening I finished the night by reading this poem of hers. Most appropriate at what was very much a "We/You/Us" event. It's that 7.45 feeling. Everything ready. Magazine printed, looks good. Contributors invited. Write up in local press. 45 chairs waiting. But will anyone turn up? No need to worry. By 8.20 we were bringing in extra chairs and in the end we must have had almost sixty in the audience. And what a great audience. I said something about it being a most sympathetic audience because everyone there was either a reader or connected to a reader by blood or love. Paddy Smith, our chairperson, did his usual great job in welcoming everyone and making them feel at home. Our guest speaker, Michael Slavin, spoke about developments in communications illustrating his chat with personal experiences - being able to use a mobile phone to relay reports to RTE from Ballivor Horse Show rather than having to race down the village to the phone box was a milestone! Then the readings. We had readers from Dublin, Louth and Cavan. Danielle McLaughlin came all the way from Cork to read her well-crafted story In the Shore Field which the audience loved. We were delighted to see Peter Goulding in the audience as well. He may have some comments on his blog later! Our own writers did very well. Caroline Carey Finn, just back from a recording session at RTE for Sunday Miscellany, read her B is for Book and Jenny Andersson's Finding Heaven with its clever use of song titles went down very well. Now I have to do the tidy-up work - post contributors' copies, get some into the shops, pay the hotel, update the website, relax. You can purchase a copy of Boyne Berries 11 on the website. It's available in the Post Office and in Antonia's Bookshop, Trim. and in Michael Slavin's bookshop, Hill of Tara. 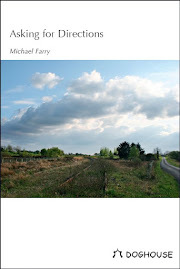 Boyne Berries 11 will be launched tomorrow evening, Thursday 29 March, by Michael Slavin. Castle Arch Hotel, Trim 8pm. All welcome, free admission, tea and coffee. All in readiness more or less. Just have to collect the magazines from the printers, organise a final list of readers, check that the hotel hasn't forgotten us, make sure our chairman has a funny speech ready, find the notices to direct the throngs to the correct function room and . . .
Just the usual. Next time I'm going to be more organised. Irish Writers Exhibition by Ursula Burke, a multi-media artist based in Belfast, Northern Ireland, specialising in photography and sculpture, runs from 2 to 30 March 2012, in Johnston Central Library, Farnham Centre, Farnham Street, Cavan, curated by Karen Downey. 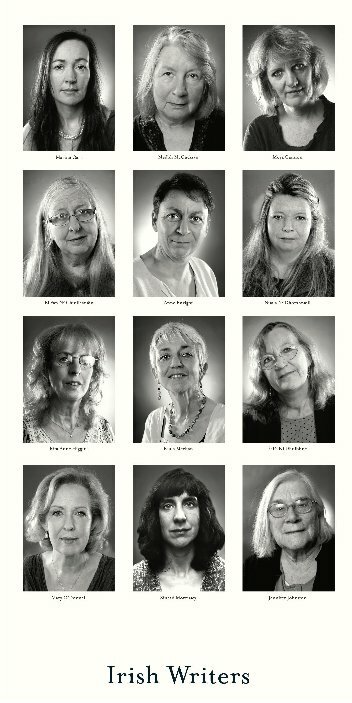 This project is a series of contemporary photographic portraits of Irish women writers. Writers photographed include Moya Cannon, Marina Carr, Anne Enright, Rita Anne Higgins, Jennifer Johnston, Paula Meehan, Eiléan Ní Chuilleanáin, Nuala Ní Dhomhnaill, Éilís Ní Dhuibhne, Medbh McGuckian, Sinéad Morrissey and Mary O’Donnell. The commission aims to highlight and support increased national, and international recognition of women’s writing from Ireland in recent decades, and modestly proposes to render the face of Irish women’s writing more visible. 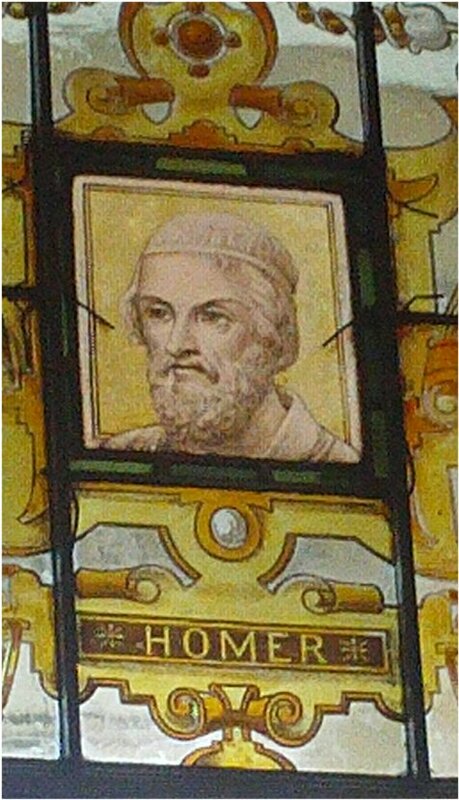 The exhibition consists of twelve portraits. The portraits are also presented in the form of a poster entitled Irish Writers. The poster (right) is from this webpage. A recent exercise at our LitLab writers group was based on this poster and involved using it as a springboard for a piece of on-the-spot, unprepared writing. We did well, I think, with all sorts of reactions in prose and poetry. Very good first drafts - it will be interesting to see if anyone does more work and produces a finished piece. I'm not sure about mine. It was designed as a visceral male reaction to being stared at by twelve insightful, knowing, sort-of-smiling, black-and-white, female writers. A Nuala Ní Dhomhnaill translation. Wishing he was somewhere else. I miss my father's overcoat. 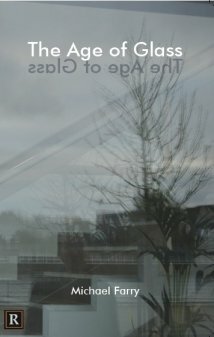 This spring, Highlanes Gallery continues developing its policy of partnering with, and programming other art forms, within the context of the gallery space and the current Collection and temporary Exhibitions, and announces a series of afternoon poetry events over the next three months titled Experiments in Mood and Meaning. Designed to explore exciting new trends in poetry and to experiment with different ways of presenting it live, the series of four events will also showcase a number of Drogheda poets and other invited bards. The series begins with poetry as drama with Adventures in the Word Jungle on Saturday next 31 March at 3.00pm, when Nuala Leonard, Brian Quinn and Anne Tannam will explore the extra impact possible from multi-voice readings (directed by Brian Quinn). Then poetry as story is the theme on Saturday 14 April at 3.00pm, in Storylands of Hard Life Experience when the dominance of lyric poetry is challenged by the energy and honesty of longer narrative forms, featuring Patrick Dillon, Terry McHugh and Karl Parkinson. Then, on (Bank Holiday) Monday May 7 at 3.00pm, during the annual Drogheda Arts Festival, it is poetry and music as ambiencellist Claire Fitch improvises to Roger Hudson’s moody life poems to create Interactions in the Sonic Supersphere. The series rounds off, on Saturday May 26 at 3.00pm, with Lapwing Poets, a tribute to Lapwing Publications, the fiercely independent Belfast publisher which continues to discover poets establishment publishers ignore with poets Marie MacSweeney, Trim's own Tommy Murray and Adam Rudden. This programme has been funded by Create Louth and Highlanes Gallery. The gallery is grateful for the on-going financial support from Drogheda Borough Council, the Arts Council and Irish Cement Ltd.
Last visit to the National Library, Dublin on Thursday last for a few final checks on page references etc. Then the last few amendments to the text, chapter headings added, basic acknowledgements and list of abbreviations included and a dedication. The lot has been emailed off to the editors. Yipee!! OK there may be some small things to be done - photographs to be finalised, cover decided - but it's over. I checked my emails and find that I replied to the initial query about doing this book on 15 April 2010, just under two years ago and just after coming back from a holiday at Lake Garda. Thank you very much for the invitation which I received yesterday after returning from a holiday in Italy. I am retired and haven’t done any research or historical writing for some time but I am tempted by your invitation. Would it be possible to meet either or both of you to discuss it further? I am available most days and can call up to the college when it suits you. I met the editors very soon afterwards and agreed to undertake the project. It's been an interesting two years. 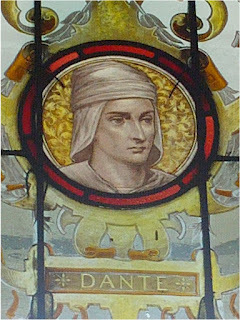 Top left and right: Images of Dante and Homer from the stained glass windows at the National Library. One overall prize of €1,000. The Prize is open to everyone, as long as the work is original and previously unpublished. The Moth‒Altun Short Story Prize, The Moth, Cavan, Co. Cavan, Ireland. You can also ENTER ONLINE. Closing date 30 April 2012. The entry fee is €8 per story, or €9 if paying by money/postal order. The prize will be judged by the award-winning novelist and short story writer, Christine Dwyer Hickey. You can read an extract from her new novel, The Cold Eye of Heaven, in the autumn 2011 issue of The Moth. 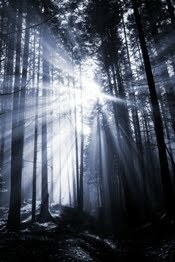 This competition is a search for a short story inspired by the magic of Dún a Rí Forest Park, Kingscourt, Co. Cavan. It aims to create a lasting legacy for the Forest which also acknowledges the existence of the unique sculptural works that have been commissioned for the Forest. This short story could be viewed as a modern day legend that informs popular vocabulary associated with the Forest and contemporary Irish identity. The finished work will be published in e-book format and formally launched in August 2012 in conjunction with the sculptural work commissioned for the Forest. The winner will also be awarded €500 and a commemorative scroll. For further information and competition entry, you must register here. All entries to be submitted on line by 4pm on Thursday 17 May. View or download rules and criteria here. Meanwhile the garden is looking very well. The mild dry winter (It was mild and dry wasn't it) here in Ireland allowed plenty of tidying time and the lawn has already been mown. The usual flowers making their appearance. Daffodils at more or less the expected time, the newly planted snowdrops now gone and the tulips ready to bloom. The nice thing about the informality and lack of planning (more or less) of the garden is the surprise of the unexpected when flowers you planted and forgot about bloom. 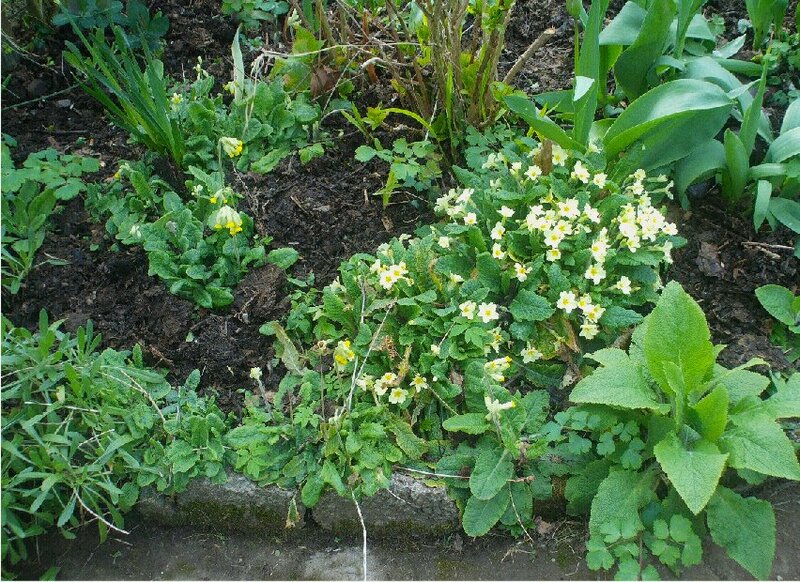 Or even when the expected flourish as is happening with the primroses - year by year a larger clump. 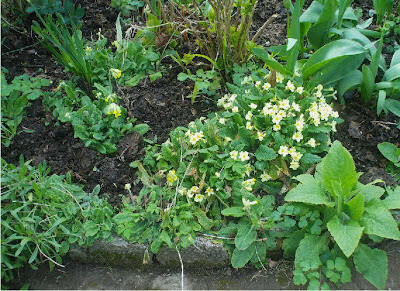 Photo above - a few cowslips as well but they seem not to multiply at the same rate. 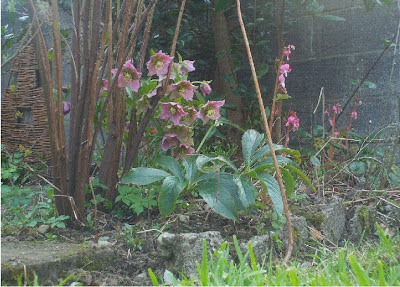 And an unexpected hellebore (below). My Christmas rose, helleborus niger, was a disappointment this year but this one makes up for it. Beside it my Bleeding Heart, dicentra spectablis, which is another disappointment. It seems to have bloomed at least a month earlier than last year and with much less blooms and foliage. Do you have a box hidden deep in the attic or under the bed that holds your greatgrandfather’s diaries? Maybe a letter from the front line? A photo taken at the time? Is there a special story behind it? If so, the National Library of Ireland wants to see it. The Library in conjunction with Europeana (Europe’s digital library, museum and archive), Oxford University, and cultural organisations, is helping to build the first ever online European archive of private stories and documents from World War One in time for the 100th anniversary of the outbreak of the war in 1914 — and are looking for your help in order to achieve this. On Wednesday 21 March, we will be holding a World War One Family History Roadshow from 10 a.m. until 7 p.m. in Kildare Street, Dublin. 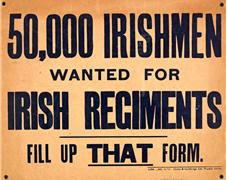 On that day, people across Ireland will be invited to bring in photographs, letters, postcards, medals, coins, keepsakes, diaries, sketches, army discharge papers, rosary beads, recordings and other memorabilia belonging to family and friends who took part in World War One, and to have their stories recorded. The project, which began in Germany in 2011 after an initial pilot in Oxford, is being rolled out in the UK, Luxembourg, Slovenia, Denmark, Belgium and Ireland this year to create a unique pan-European virtual archive of World War One that is available to everyone. Some of the most fascinating items found to date are described and pictured on the website of the project, at http://www.europeana1914-1918.eu/en/explore . At the 21 March roadshow, we will have historians and experts on hand to talk to visitors about the significance of their objects. The material will be scanned on the spot by our staff and people will then be free to take their precious memorabilia home with them. Once scanned, the material will be uploaded to the Europeana 1914–1918 website. If you can’t get to the roadshow, you can still add scanned documents and photos on the site, uploading them in much the same way you would on Facebook. Any questions? Get in contact at europeana1914-1918@nli.ie, or call Katherine McSharry, National Library Head of Services, on 087 9948144. This is from the Irish Times, 16 March 1912, one hundred years ago. Click on the image to enlarge it. Our Donegal Guardian, Danny, wanted three glasses of whiskey for gents but only one glass each for the ladies. Gender inbalance. It had to be "good" whiskey. Did he mean Tyrconnell Whiskey? St Patrick's Day was a bank holiday then. The expectation that Home Rule was inevitable and the implication that under Home Rule prosperity would flourish and there would be plenty of whiskey for all. According to the 1911 Census of Ireland online there were then sixteen Daniel McCarrons in County Donegal. A check on their addresses would narrow that down and it should be possibly to find our devilment-maker. There were four Denis Divers in the county, one a nine year old on Tory Island, so our apostle of temperance was one of the other three, presumably the 64-year old living in Inisowen. 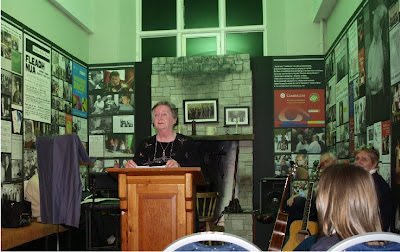 A very enjoyable evening of music and readings at Cavan County Museum last evening. A great venue with history and music all around. We read in one of the upstairs rooms with a Ceomhaltas display on the walls and a room dedicated to Percy French close by. And we had Percy's Come Back Paddy Reilly to Ballyjamesduff played by the wonderfully lively musicians, John McBreen and Pete O'Connor, and sung by the enthusiastic audience. Paddy Smith of LitLab was volunteered to be MC for the night and he did a great job setting the tone with just the right mixture of respect and ribaldry. LitLab was well represented by Pat Devaney, Mairéad Donnellan, Honor Duff, (pictured above) Paddy and myself. Pat led the way with two well-chosen, well crafted poems, one on a cherry tree and one suitably on shamrock. Mairéad read her amusing They're only here for Heaney which went down very well as did her Noah's wife poem. Honor's sharp piece on 1916 and current economic troubles wasn't funny but was well received. Paddy read his story dealing with an insurance salesman trying to figure out if his potential customer is Protestant or Catholic. I've heard a few versions of this and it just keep getting better - thanks to my suggestions! I read two new poems, the translation of Tadhg Dall O hÚiggin's poem and my St Laurence O'Toole's heart poem. Reading aloud is a good way of testing the poem. Both passed the test though the translation needs a little more work. Then the special guest, Ailis Ní Ainle, a post-primary teacher, read three of her poems in Irish. I really enjoyed these. Nice bi-lingual introductions but no attempt to provide a full translation which is great. I always think that if the poem is being translated into English what's the point of reading it in Irish at all. I particularly liked her poem on her visit to the Aran Islands and its effect on her with its reference to the well-known Irish language poet Mairtín Ó Direain. 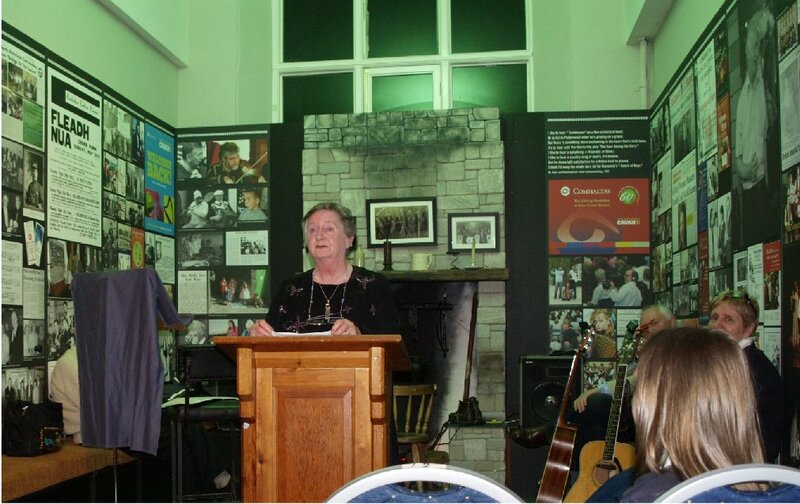 Thanks to the organisers of the evening, Honor Duff of LitLab and and Savina Donohoe of the Museum. 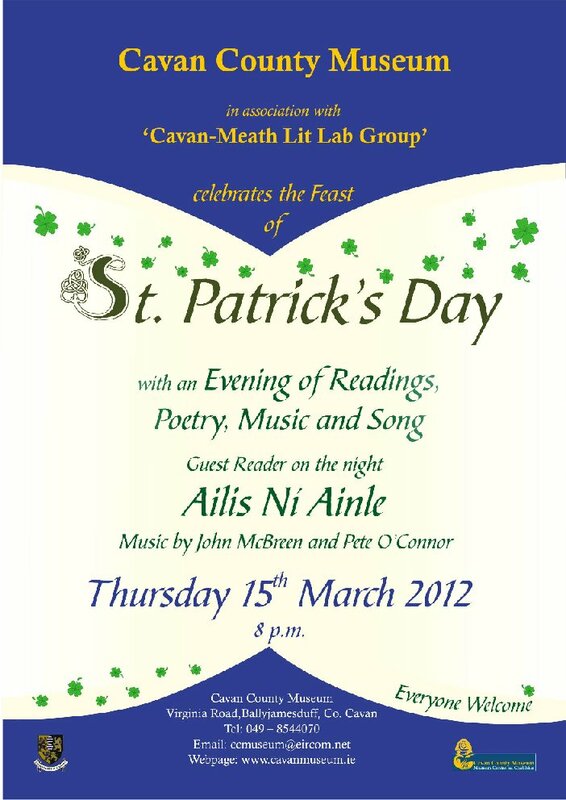 Our Cavan-Meath LitLab group is participating in a reading for St Patrick's Festival in Cavan County Museum, Ballyjamesduff on this Thursday evening at 8pm. 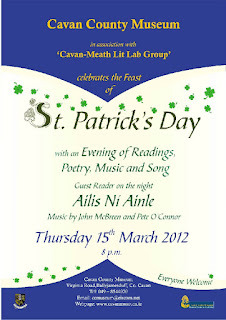 It should be a good night with music by John McBreen and Pete O'Connor and poetry in Irish from Ailis Ní Ainle. And the LitLab will do their usual mix of prose and poetry. 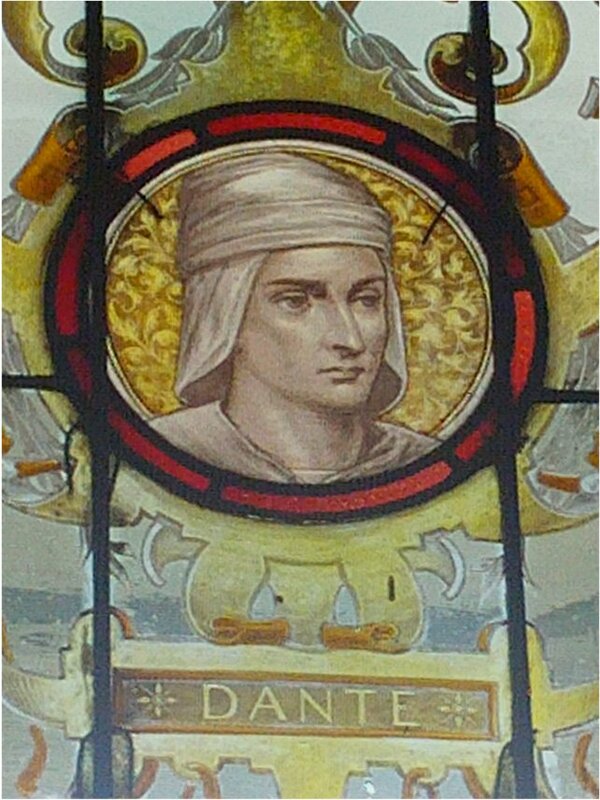 We are encouraged to include at least a nod towards the festival so I'm going to read my recent English translation of a poem written in Irish in 1581 by Sligo poet Tadhg Dall Ó hÚigínn. Also I was recently challenged to write a poem on the theft of the relic of St Laurence O'Toole from Dublin so I might include that as well. Thursday 15th March 2012, 8pm. After the celebration and excitement of Boyne Berries 10, issue 11 is in danger of being overshadowed. We have gone back to our usual black and white, standard size, no images apart from the cover, style. We couldn't afford to keep up the standard of issue 10 though we are very proud of that production. We are also proud to have managed to keep the magazine going for so long. Sales don't cover costs. More writers send material to the magazine than buy the magazine. To date we have got small, much appreciated grants from Meath Arts Office for three of the issues. The Boyne Writers Group funds the magazine from the members' meeting contributions. 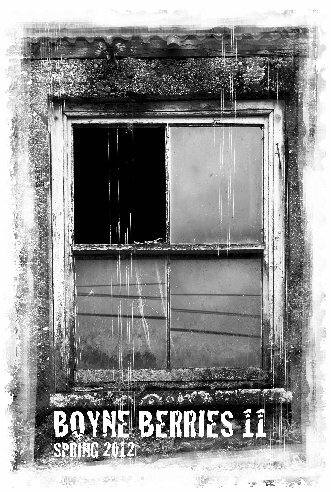 Issue 11 has been put together, cover image supplied by the ever reliable Greg Hastings, the pdf sent to the printers, the first proof corrected, the launch planned. It will take place in the Castle Arch Hotel, Trim on Thursday 29 March at 8pm. The magazine will be launched by Michael Slavin. Michael Slavin has been an equestrian correspondent since the 1960s. He also commentated on show jumping events for RTÉ Radio Sport. He is the author of Showjumping Legends Ireland 1868-1998, The Ancient Books of Ireland, The Book of Tara and Ambassadors on Horseback: the Irish Army Equitation School. He now runs an antiquarian book shop at the Hill of Tara. I'm glad that's over! I was nervous before the TG4 screening of Ealú on Thursday night. (Repeat this Monday 12 March at 00.10 and should be available on TG4 Player after that). I had seen a preview of the programme in Sligo last year but it's different when you know lots of people are watching. I hadn't realised that I appeared so often in it. Anyway Magamedia and Paddy Hayes did a great job telling the story in an economical fashion. The use of reconstruction was very effective within what presumably is a very limited budget. 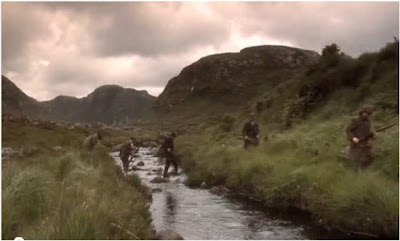 As was the use of newsreel from the period, none of it from Sligo as far as I am aware. 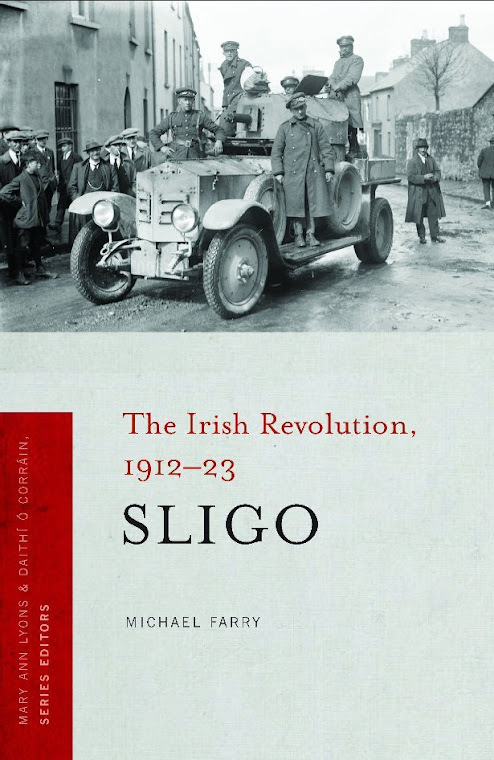 Having just completed my umpteenth edit of the Sligo 1912-1923 manuscript where every word, every nuance of meaning is important I kept wanting to change parts of the script and shout It wasn't exactly like that actually, that's gives a wrong idea or The facts don't actually bear that out. I did like the fact that at one stage myself and another historian disagreed about the significance of the IRA breaking down Sligo gaol door. Now to finish the last edit of the history book and the poetry collection and organise the launch of Boyne Berries 11. TG4 will broadcast the episode of EALÚ which deals with the rescue of Frank Carty (right) of Sligo IRA from Sligo gaol in 1920 at 10.30 pm tonight, Thursday, with a repeat on Monday at 00.10. It should be available on the TG4 Player after transmission. I was interviewed as a local history "expert" for the programme and some parts of the interview will be included. I speak in Irish but subtitles will be used for those who can't understand Irish or can't understand my Irish. The series is made by Magamedia from Galway. I've already seen the programme at a preview in the grounds of Sligo gaol last year. It's very well made with clever economical effective use of reconstructions. I did think the scene where the IRA leader, Billy Pilkington, who became a Catholic priest afterwards, stole a Bible from Carty's cell a bit too clever! Ah well, that's TV for you. This sounds like an interesting competition. The challenge might be to find a poem which fits the category but is not an obviously stereotypical 'nature poem' - I wandered lonely as a cloud . . . It would be a pity though if the judges took the view that everything is nature so anything goes. As well as offering poets the chance to win considerable cash prizes and publication of their poems, the competition will raise money for conservation and poetry. We are working in partnership with leading independent UK poetry magazine, The Rialto, as we feel the magazine will be the perfect place to showcase the winning entries. 1st prize is £1000; 2nd Prize is £400; 3rd Prize is £300. Additional Prize is a personal tour with Mark Cocker of his most cherished wildlife places in East Anglia. The two judges are former Poet Laureate, Sir Andrew Motion and the leading Nature Writer, Mark Cocker. The entry fee is £6 for the first poem and £3 for each subsequent entry. Full details and the facility to enter online can be found on The Rialto website. If you would prefer to enter by post, you can download an entry form from the website. So what is Nature Poetry? As the flier says, the judges will give this a wide interpretation. That’s up to them, but I’d imagine it won’t have to be just poems about creatures and beings that share the planet, or about ‘environmental concerns’. We are all air and water, everything we eat comes from the earth or the sea, most people know the roughness of a leaf or the heft of a stone can change a mood or express a feeling. I asked a 16 year old, What is nature? and she said, insects and grass: I asked a 32 year old the same question and she said, the sun and the moon and the stars and flowers and fruit and babies. You might just have to write your poems and take a risk. This may be the final edit of the history book. Making sure every comma is in the correct place, making final decisions on capitalisation - is it Civil War or civil war, war of independence or War of Independence? The importance is in the consistency. And a sentence to rephrase here and there where I have reused the same word too often, too close together. And some sentences to be rewritten where I need to make the reader more aware of the significance of what has happened and prepare the reader for what is about to happen. And the footnotes, italics, capitals, lower case, colons, semi-colons, abbreviations, commas each in its proper place. Anyway it's great to be finally at this stage. There were times I didn't think I could do it! The book is in the 2012 Four Courts Press Catalogue though (I'm inclined to overuse that word) the cover hasn't yet been finalised. The image to be used on the cover is chosen and is included. It's a great photo of pro-Treaty troops in Old Market St., Sligo on Easter Sunday 1922. This event, both evenings, is sold out. They are investigating the possibility of using a larger venue. You can put your name on a waiting list on the website. The evening will start with a screening of Life Is Bearable at Times. This rare and full of humour documentary presents Wislawa Szymborska at her usual trips, with her friends and admirers like Umberto Eco, Woody Allen, Vaclav Havel, Jane Goodall, in her normal life and at some official events which she simply hated. In the second part of the evening the prominent Irish female poets and writers will read Szymboska’s poems in the English translation. Polish version of the poems will be also presented. Where available we will use the recordings of Szymborska reading her own works. Our meeting on Thursday evening was unusually well-attended with fourteen members present. We had great readings and criticism - poetry including haiku, drama, story and novel extracts, opinion pieces and memoir - and got through the lot in good time thanks to our efficient chairperson, Paddy Smith. Some good news about members' successes as well. Orla Fay is tops as far as publication credits go, having had poems published in Crannog, Census 3 and on-line at Silver Blade magazine. And it's only March! Caroline Carey Finn also told us that she has another piece accepted for Sunday Miscellany. Here's the secret. She took a piece she had previously submitted to the programme, retitled it, included a note pointing out how topical it was and they got back to her straight away. The piece is about mock exams in secondary schools. We also are organising a series of workshops for the group, our Boyne Readings and Open Mic are due to recommence in April and Boyne Berries 11 will be launched at the end of this month. A busy group!! On 5 March 2007 a bomb was exploded on Baghdad's Al-Mutanabbi Street, located in a mixed Shia-Sunni area. More than 30 people were killed and 100 wounded. Al-Mutanabbi Street, the historic centre of bookselling in Baghdad, holds bookstores and outdoor bookstalls, cafes, stationery shops, tea & tobacco stores. 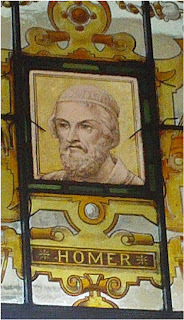 The Al-Mutanabbi Street coalition was formed in response to the bombing by poet and bookseller Beau Beausoleil in San Francisco. It initiated and completed a broadside project with contributions of 130 broadsides from 130 letterpress printers, some of which were exhibited at the Market House in Monaghan and the Central Library in Dublin last March. Al-Mutanabbi Street Starts in Dublin is the Dublin edition of a series of events taking place around the globe on 5 March 2012 to mark the 5th anniversary of the bombing, and will feature readings, performances and exhibitions by the Ireland-based participants in 'An Inventory of Al-Mutanabbi Street' and other friends of these projects. The writers, performers and artists contributing to the evening are Alansary, Cah-44, Evelyn Conlon, Sue Cosgrave, Djeribi, Kit Fryatt, Judy Kravis and Sarah Lewtas. The event is co-ordinated and will be introduced by Christodoulos Makris. The venue is The Winding Stair Bookshop, 40 Lower Ormond Quay, Dublin 1, and start time is 7pm. Admission is free.